Are You An Election Worker For The March 2nd Primary? If you are an Election Judge, Alternate Judge, or Clerk for either the Democratic Party Primary or Republican Party Primary it is mandatory by law that you attend an "Election Law" training class. It is also highly recommended that you attend a "Machine Training" class. Machine Training will give you hands-on experience on the Direct Recording Electronic (DRE) touch screen voting booth equipment and the ePollBook laptop computers being used for this election. County are covered in this live class. Saturday, February 20th at 10:00am. Friday, February 26th at 9:00am. In the March 2010 primaries Texas voters will choose which candidates will represent their respective political party in the November general elections. Texas is somewhat unique in that the Democratic and Republican political party organizations in each county are in charge of running their own primary elections with funding from the Texas Secretary of State. State of Texas residents vote in what is known as an open primary. This means that as long as a qualified Texas resident registers to vote at least 30 days prior to the date of the primary election day, that person will be allowed to vote in either the Republican or Democratic primary election. The voter is then affiliated with the party they select for the primary and restricted from participating in events of other political parties for the remainder of the primary year. The March 2, 2010 Primary Election Voter Registration Deadline is Monday, February 1st. New voter registration applications must be postmarked by midnight of that date. Click here for the Texas Secretary of State's voter registration form web page. Click here to see the Democratic Candidates that will appear on the Democratic Primary Ballot In Collin County. Texas does not register by party, rather one becomes “affiliated” with a party by voting in the party’s primary election. That affiliation then lasts for that entire primary year. As an example, if a person voted in the March 2008 Democratic Primary or April 2008 Democratic Primary runoff, that person's affiliation with the Democratic party did not expire until December 31, 2008. The affiliation means that the person may not vote in another party’s primary or primary runoff, or participate in another party’s precinct, county or state convention or sign a for another party's candidate if the candidate’s position appears on the primary ballot. A person who votes in the 2010 Republican Primary is disqualified from participating in the Democratic party’s precinct, county and state conventions, and vice versa. The Republican affiliated voter is also restricted from participating in other local and state Democratic Party activities, including being nominated by the Democratic Party to serve as an Election Judge, Alternate Judge or Clerk. Note: In the November General Election voters may vote for whomever they wish, regardless of how or whether they voted in the primary or runoff primary election. All candidates of all parties appear on the same November General Election ballot. Adopt resolutions that will be submitted to the Democratic Collin County Convention. 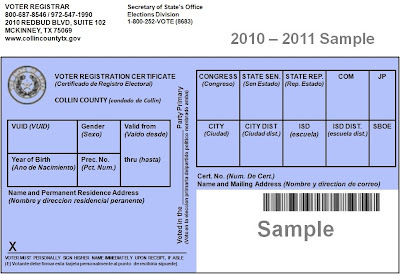 For more information on the new Blue and White 2010-2011 voter registration cards, click here. Elect delegates and alternates to the 2010 Democratic Collin County Convention. Adopt resolutions that will be submitted to the county convention. Collin County residents must have voted in the 2010 Democratic primary in order to sign into one of the 179 Democratic precinct conventions, which convene shortly after the polls close on March 2nd, at the 65 polling locations around Collin Co. Republican primary voters will also conduct their own precinct conventions at different locations within the same 2010 primary election day polling locations. March 2nd polling locations will have one to several separately convened Republican and Democratic Party precinct conventions, in different locations around the polling places' gym, cafeteria, lobby and so forth. People must locate and attend their party's precinct convention for their home address voting precinct. Each Primary Election Day Polling Place Democratic Election Judge will contact the Democratic chairs of precincts voting at his/her polling location before election day to coordinate the election evening precinct convention hand off. Otherwise, for any precinct without a chair, the Democratic Party of Collin County Primary Administrator will give a list of 2008 precinct convention delegates to the Democratic Election Judge to contact for election evening precinct convention hand off. The Precinct Chair typically serves as the temporary precinct convention chair to organize the precinct convention, but, in the absence of a Precinct Chair, anyone who votes in the party's 2010 primary may serve as temporary chair. Anyone who wishes to help organize the election evening precinct convention for their home voting precinct should contact the Democratic Party of Collin County office at either 972-578-1483 or elections@collindems.us and ask for the Primary Administrator. Voters who VOTED in the Democratic primary (either early, or by mail, or on election day) can participate in the precinct convention for the precinct where they are registered to vote. You can find your precinct number on your Voter Registration Card in the box titled "Prec. No." You can see your Registration Card online by clicking here. 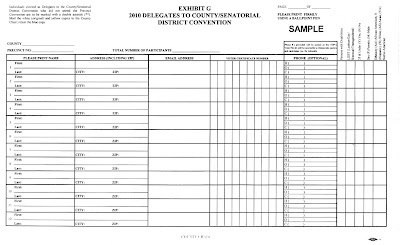 The Democratic Party Precinct Chair of your precinct has priority in terms of convening the precinct convention and is considered the temporary chair of the convention; however, any registered voter from the precinct who voted in the 2010 Democratic Primary can start the convention in the event the precinct chair does not attend the convention, or the precinct chair position is vacant. The precinct chair, or other person intending to serve as the temporary chair of the convention, inspects the polling location to determine a good location for the convention. A large sign is placed at the polling place telling exactly when and where the convention will be held. Each voter should also be provided the information verbally and given a hand-out reminder. The county party provides a convention packet with instructions, forms, and an easy to fill-in agenda/minutes. The packet is typically kept at the Primary Polling Place by the Election Judge for the election day polling location. The packets are handed off to the temporary chair at the time that the Election Judge declares the Election Day Polling Place closed or at 7:15 P.M., which ever is later. If the precinct chair does not claim the package within 15 minutes after the poll closes and the last voter in line has voted, any registered voter from the precinct who voted in the 2010 Democratic primary and is attending the precinct convention can serve as the temporary chair of the convention. The temporary chair, after obtaining the precinct convention packet from the election judge, convenes the convention for his/her precinct, and serve as the temporary chair to call for the election of the permanent convention chair. Most of the convention activity is set by state law, the Rules of the Texas Democratic Party, and Robert’s Rules of Order. In which precinct they are registered to vote. If they did not vote in the Democratic primary, they are not eligible to participate in the convention, though they are welcome to attend and observe. If they did vote in the Democratic primary, direct them to the convention location for the precinct in which they are registered. An effort will be made by the temporary precinct convention chair to confirm that each convention attendee voted in the Democratic primary and lives in the correct precinct by checking their stamped voter registration card, or primary voting verification receipt slip. Note: not everyone who voted in the 2010 primary will have remembered to have their card stamped or request a voting verification receipt slip. If the voter presents neither a “Democratic” stamped voter registration card nor a primary voting verification receipt slip, voting verification will be completed by checking the list of early voters for each election precinct provided to each Election Judge by the county election registrar, and the poll list of election day voters. 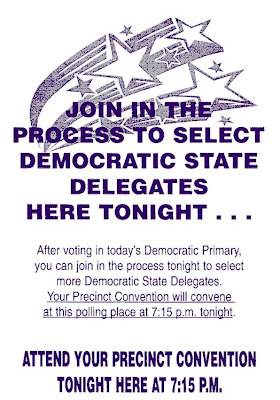 If people arriving for the convention do not have evidence that they voted in the 2010 primary, they must still be permitted to participate, so long as they state they did voted in the Democratic primary, though in this case, the County Convention Credentials Committee must later check and validate their eligibility status. This could change the results of delegate allocations, if individuals are later found ineligible to have voted in the precinct convention. If the person voted in the Democratic primary and is in the correct precinct, their name, address, voter registration number and other information must be entered on the "exhibit A" sign in form. In presidential election years, people must state their presidential preference when they sign in to participate in the precinct convention. Since 2010 is not a presidential year, convention participates will not state a presidential preference as they sign in to the convention. Step 3: Once everyone is registered on the "Exhibit A" form, the temporary convention chair calls the convention to order and asks someone to serve as the temporary convention secretary, if a temporary secretary has not yet been appointed. The first order of business called by the temporary convention chair is to elect a permanent precinct convention chair and a permanent precinct convention secretary. The temporary convention secretary must clearly print the minutes of this business on the official "Convention Minutes" carbon copy form. As soon the a permanent precinct convention chair and a permanent precinct convention secretary are elected they take over the convention and conduct business until the convention adjourns. Step 4: The next orders of business called by the permanent precinct convention chair is for the nomination and election of delegates and alternates to the Collin County Convention. 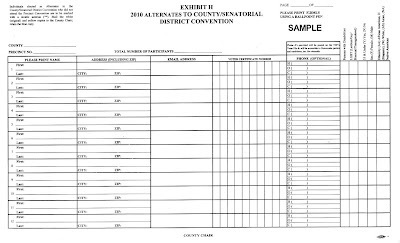 The convention packet should include a form that gives the number of delegates that may be elected to represent the precinct at the county convention. Only people who are in attendance and entitled to participate in the convention, by having voted in the Democratic primary and signed in for the precinct convention. Step 5: The precinct convention body, as a whole, will then ratify (vote for) the selection of delegates and alternates. The precinct convention as a whole will then elect a delegation chair for the Collin County convention. The convention chair then announces the delegation chair, the list of delegates and alternates, and the date, time and location of the county convention. Step 6: The convention chair then ask for any proposed convention resolutions to be read aloud. Discuss each proposed convention resolutions and approve or discard them. After all resolutions have been dealt with, convention chair asks for if anyone would like to move and second the adjournment of the convention. If the a majority of the convention body votes for adjournment, the convention chair gavels the convention to close. The convention chair must complete the forms and have both the signatures of both the convention chair and the convention secretary sign them. Elect delegates and alternates to the county conventions. Adopt resolutions that will be submitted to the county conventions. The precinct convention is the first step in the convention delegate process. That process begins at the precinct level and moves on to the county level and on to the state, and in presidential years, to the national convention. Much of what is done is set by state law, the Rules of the Texas Democratic Party, and Robert’s Rules of Order. The precinct convention is called to order by the temporary chair. The precinct chair typically acts as the temporary chair, but if the precinct chair is not available, any interested Democratic 2010 Democratic primary voter from the precinct may pick up the convention packet and convene the meeting as the temporary chair. Each Precinct must hold its own convention. If your precinct has been consolidated with others for voting on Election Day, you still must hold your precinct conventions separately. Your precinct convention may NOT begin until the last voter has voted at the Election Day Polling Place where the precinct conventions are schedule to convene or after 7:15 p.m. whichever is later. (TX Elec. Code Sec. 174.022). The Temporary Chair appoints a Temporary Secretary to assist in checking and recording convention attendee information and to record minutes of opening proceedings. The Temporary Chair and Secretary confirms that each convention attendee voted in the Democratic primary and lives in the correct voting precinct. The Temporary Chair and Secretary enters the name, address, voter registration number and other information for each person attending the convention the on the "Exhibit A" sign in form. Each voting member of the precinct convention body must be entered on the "Exhibit A" sign in form. All fields except email and phone are required, however, at least one phone number or an email address is preferred so that the credentials committee may contact these voters in case a delegate vote challenge arises requiring verification. When sign-in of all in attendance is complete, the temporary chair calls the precinct convention to order as the Temporary Secretary records the minutes of the opening proceedings on the minutes form found in the convention packet. The temporary chair calls for nominations for a permanent convention chair and the Temporary Secretary records the names of each nominee. The temporary chair then calls for a vote on each nominee's name by convention attendees. A simple majority vote is sufficient to elect a permanent convention chair to run the convention. The permanent convention chair then calls for the nomination and election of a permanent convention secretary in a similar procedure. The temporary secretary continues to record these proceedings until the permanent secretary is elected takes over recording the minutes. Convention participants may nominate themselves or any other participant. If a non-attendee desires to be nominated as a delegate or alternate, they must notify the precinct chair prior to the precinct convention. In non-presidential years, the total number of alternate delegates equals the total number of delegates allotted to the voter precinct. Nominations are held open until a motion is made, seconded, and passed by a two-thirds majority to close nominations. The convention chair announces the names of the nominated Delegates and Alternates. The convention chair calls for the ratification, by majority vote of the full convention, of the nominated Delegates and Alternates. A single Chair of the Precinct Delegation is elected by majority vote of the full convention to represent the precinct’s delegation at the county convention. The precinct convention secretary records the names of the delegates and alternates on the Exhibit G and Exhibit H forms found in the convention packet. Other business then is considered (e.g. Resolutions) The convention considers resolutions or positions on issues. It is strongly suggested that resolutions or issue position papers be submitted in triplicate. Each resolution is voted on individually after proper discussion. A majority is required for passage. By motion and majority vote, the precinct convention is concluded and adjourned by the convention chair. The convention chair and secretary sign the minutes. The original and one copy of each form are delivered to the county chair in one of the following ways. The second copy of the minutes and marked sign-in lists must be sent to the state Party in the envelope provided. The third copy is retained by the convention chair. To memorialize someone recently deceased. To congratulate a person or group. 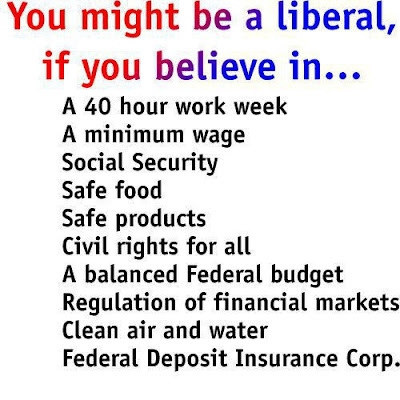 To amend the Rules of the Texas Democratic Party (TDP). To amend the TDP Platform. To urge Democratic elected officials, especially in the Texas Legislature and the U.S. Congress, to advocate certain positions on policy issues. As the delegates assembled at the state convention are the highest authority within the TDP, such resolutions should carry weight with elected officials as the consensus of the grassroots of the party. THEREFORE BE IT RESOLVED that the Texas Democratic Party supports the passage of comprehensive Private Heath Insurance Industry Reform legislation. 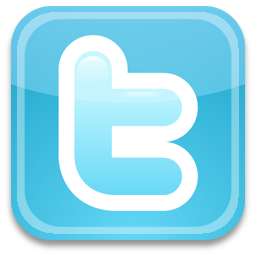 Submitted to and adopted by Precinct ___ in Collin County, Texas, Senatorial District __, on March 2, 2010. Give the resolution a title that indicates not merely the topic, but also the position to be advocated (i.e., instead of "Resolution on Private Heath Insurance Industry Reform," it would be better to put "Resolution For Private Heath Insurance Industry Reform"). List the reasons for the resolution at the beginning, each reason being in a separate paragraph beginning with the word "whereas" (capitalized, italicized or in boldface). List each action to be taken in separate paragraphs introduced by the words "be it resolved" (capitalized, italicized or in boldface). Use semicolons to separate each paragraph, and avoid periods. A well-written resolution should consist grammatically of a single sentence. Keep the resolution brief. It should fit easily on a single page. At the end of the resolution, write: "Submitted to and Adopted by Precinct ___ in ____ County, Texas, Senatorial District ___, on March 2, 2010" and leave a signature line for the precinct convention secretary, who will sign it if the precinct convention adopts the resolution. Someone has an idea for a resolution and writes it up. Priority is given when the same resolution comes from multiple counties or senatorial districts. It would be a good idea to share your resolution with others who live in different precincts and in other parts of the state. Sponsoring organizations might post a resolution on their website. The resolution is introduced at the precinct convention on the evening of March 2, 2010. If the resolution passes, it will be included in the convention packet that must be delivered to the county chair within three days after the convention. The next level is the county convention. The Resolutions Committee will meet prior to the county convention. They can amend a resolution, combine it with other similar resolutions, or vote it down. The county convention or senatorial district convention will consider all the resolutions recommended by the Resolutions Committee. Those that pass will proceed to the state convention. A Temporary Resolutions Committee will consist of members of the State Democratic Executive Committee (SDEC). They will organize the resolutions submitted for the state convention. They can pull out any resolution they don't like unless it has come from multiple counties or senatorial districts. Resolutions that are not statewide in significance (except for memorial or congratulatory resolutions) will not be considered at the state convention. Resolutions concerning TDP Rules or the TDP Platform will be referred to the Rules Committee or the Platform Committee. At the state convention, each senatorial district elects one member for each of various committees, such as the Permanent Resolutions Committee, the Rules Committee, and the Platform Committee, and others. If the Permanent Resolutions Committee works expediently, they will consider all of the submitted resolutions, combine them with others as possible, and then refer them for a vote on the convention floor. If they waste time, worthy resolutions will fall by the wayside. At the state convention, other resolutions may be introduced that haven't come through a county or senatorial district convention by petition of 20% of the delegates (using the proper form). Resolutions passed by the state convention will be sent by the SDEC to the Democrats elected to the Texas Legislature and U.S. Congress, as appropriate. 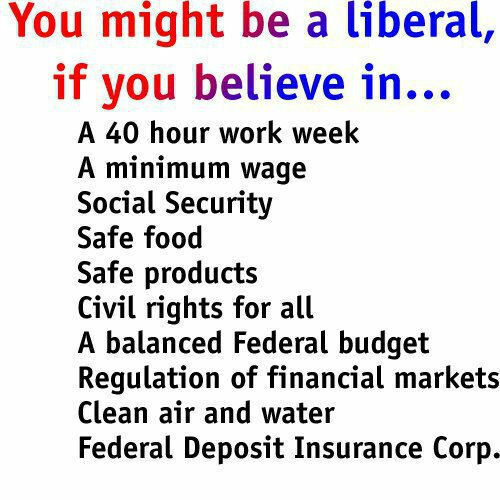 Hopefully our representatives, whom we work so hard to get elected, will pay attention to us! 2010 Democratic Primary Candidates For Collin Co. The following individuals have met the legal requirements to appear as candidates on the 2010 Democratic Primary Ballot in Collin County to seek the nomination of the Democratic Party for the offices shown. The offices and the candidates below are listed in the order they will appear on the March 2, 2010 Collin County Democratic Primary Election ballot.